Learn about active detours, path/lane closures and any changes to traffic conditions that may impact people who ride bikes. Tram works on Holmes Street between Blyth Street and Moreland Road in Brunswick will cause detours to the East Brunswick shimmy route from 10:00pm on Friday 22 February to 5:00am on Tuesday 26 February. The works will block access to the Eddy Street section of the shimmy that links Albion Street to Stewart Street. A detour will direct riders along Ashmore Street instead of Eddy Street. Riders are reminded to follow signage and directions from traffic controllers. Click here for a detour information sheet and map and here for an information sheet about the tram upgrades. Sections of the floating pontoon that is part of the Main Yarra Trail at Burnley have become damaged and will be repaired this week. The damage has occurred about 200 metres from the Church Street underpass and has been marked with bollards and reflective tape. At this stage no closures or detours have been planned but riders are asked to take care around the damaged area. The shared path along Hyde Street, Yarraville, will be detoured for a short distance during works on the road over the coming month. The bridge over the Stony Creek is being upgraded and the path over the bridge will be closed during working hours 7:00am to 6:00pm from Monday to Friday and 7:00am to 3:00pm on Saturdays. A scenic detour has been arranged that takes bikes on the boardwalk across the lagoon and under the West Gate Bridge. The shared user path is reopened to the public outside of these hours. There is signage on site and traffic controllers to guide the pedestrians and cyclists through the detour. The busy Collins Street bike lane will be crimped for space from Monday when a concrete pumper sets up house on the street outside the City Square at Swanston Street. The pumping operations will take over the bike lane where it approaches the Swanston Street intersection, westbound. The presence of the pumper and associated concrete trucks will require bikes to merge with traffic, creating a risky pinch-point. Fortunately, the pumper will only operate outside of peak periods, predominantly between 12 noon and 3pm each day. It is uncertain how long the pumping operations in Collins Street will continue, however the contractor indicates it will be at least until March. The works are part of the new Metro Tunnel station construction. The concrete is being used for the piling required for the station walls as it is excavated deep underground. The installation of safety barriers outside Flinders Street Station and blocks on both sides of Princes Bridge will have some impact for people who rides bikes over the next couple of months. The installation of permanent security measures is part of the Victorian Government’s $50 million CBD security upgrade project. With stage one of the works outside Flinders Street Station completed in December 2018, stage two and three will begin on Wednesday 9 January. Stage two and three works will take place primarily at night, between 8pm and 6am. The pedestrian crossing will remain open throughout the works, other than on the nights of 9-10 and 14-15 January. The westbound traffic lane on Flinders Street will also be closed on those nights, along with a single northbound lane on Swanston Street. Traffic management will help detour motorists and bike riders. It’s expected the Flinders Street Station works will have minimal disruption for people who ride in the precinct. Works to install reinforced concrete blocks along the footpath on the west side of Princes Bridge will begin on Monday 14 January with the east side to begin between March and April. West side works will take place during the day between 9am and 4.30pm during January, and between 9.30am and 4.30pm between February and March. During this time the footpath and bike lane will be completely closed, with pedestrians redirected to the opposite side of the bridge. Bike riders will use the traffic lane. The bike lane will remain open during the morning and afternoon peak commuter periods. Riders heading out to Mt Hotham should be aware of some damage to the Great Alpine Road which is affecting the road's surface. For a road designed to deal with the cold, snow and ice extremes of winter, the Great Alpine Road between Harrietville and Mt Hotham road has suffered a little in the recent extreme heat. The affected stretch of road is between Old Coach Road, Harrietville to Loch Car Park Road, Hotham Heights. Thankfully, Regional Roads Victoria have been quick to respond. To deal with the bleeding seal, gravel has been spread over and rolled into sections of the surface that softened in the heat. Please be aware that the affected sections of road could be slippery or unrideable. All road users are advised to take extra caution, particularly on the descent. VicRoads crews are on site treating the affected areas. The road remains open and we recommend that you carefully prepare and plan any use of the road on your bike. If you’re unsure, it may be best to do a little recon first and drive the road to check its current condition before riding. Riders on Latrobe Street in Melbourne should be alert to kerb and footpath works on the north side of the road between Exhibition and Victoria Streets during the next few weeks. Works as part of the Neometro project at Jewell Station will result in the Upfield bike path being closed for almost years between Barkly Street and Union Street. 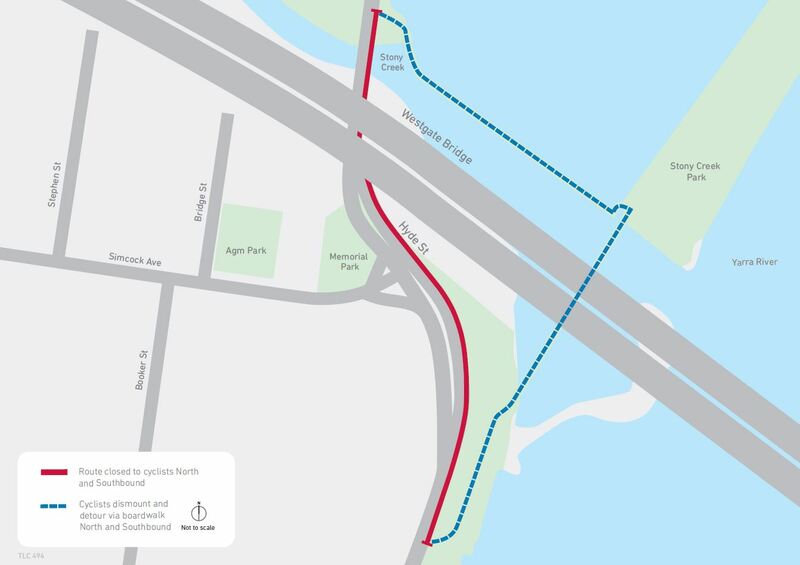 Bike riders will be redirected via an off-ramp at Barkly Street, around Black Street and Wilson Avenue before rejoining the bike path at Union Street. There will be cars using these streets during this time. Extra care should be taken on Wilson Avenue which has blind corners. Click here for an information sheet from PTV and VicTrack. Got a detour or road closure that's not on our list? Please send an email to campaigns@bicyclenetwork.com.au.